IT is important for people to feel a connection to something larger than oneself, said Ed Diener — a leading psychologist in the study of positive psychology. That said, various studies about positive psychology over time have been conducted with various variables but all studies seem to have one strong message; happiness is subjective. 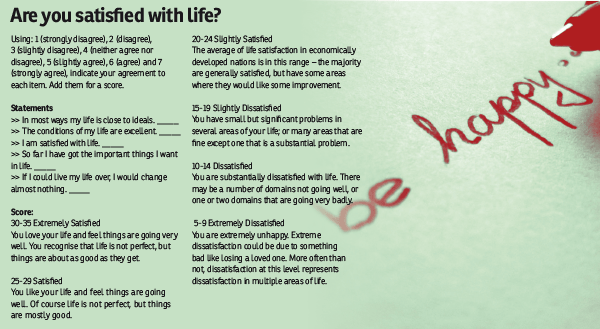 In his findings recorded in The Satisfaction with Life Scale. Journal of Personality Assessment (in which the quiz on the right also appears), Diener said two main elements that contribute largely to life satisfaction are social relationships and having attainable goals derived from one’s values in life. There is no key element to guarantee a 100% satisfied and happy life but various ingredients chip in to make it whole. If your reflections relay that you are unsatisfied with the quality of your life and your scores emphasise that same fact, try some of Dr Timothy Sharp’s suggestions. Sharp is the founder of the Happiness Institute and author of 20 Simple Tips to be Happy Now. Among the tips include making happiness a priority. Do what makes you happy and remember to pamper yourself. Identify your strengths. Know your faults and weaknesses to avoid problems. Utilise your strengths. Although we all can and should endeavour to improve in areas of weakness there’s just as much, if not more, to be gained from focusing on the maximal utilisation of strengths — positive qualities and attributes included. There is always a bigger picture at play. Set happy goals. Once you understand what you do best, set effective and practical goals. Make sure your goals are specific, measurable, achievable, relevant, and timed. Play and have fun. Don’t take life too seriously. We all have responsibilities but there’s no reason why we can’t approach much of our lives in a playful manner. Be curious. Constantly search for new ways to be happy. Approach life and have fun. Everyone is different and embrace your new found happiness. Be grateful and appreciate what you have. Count your blessings; always. Live in the present moment. Author Henry Miller said: “Every moment is a golden one for him who has the vision to recognise it as such.” The only moment in which we can truly be happy is the present moment. The only moment over which we have control is the present moment. Learn to like and ideally to love yourself. We must love before we can be loved. To love others and to be loved by others is a key component of happiness. This article first appeared in The Edge Financial Daily, on January 27, 2015.